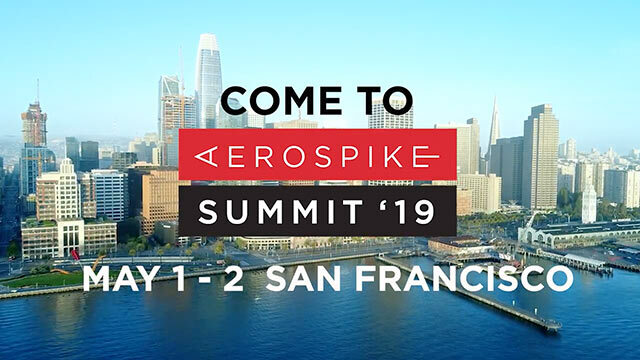 The excitement is building at Aerospike as we get closer to Summit ’19. There are only a few seats available for the May 1-2 conference – be sure not to miss out. Here are the top five reasons you need to be there. Outstanding presentation line-up: Speakers from market leaders such as PayPal, Airtel, The Trade Desk, Wayfair, Hewlett Packard Enterprise, Intel and Nielsen will share their success stories using Aerospike to improve both top- and bottom-line business results. Fantastic networking opportunity: CIOs, chief data officers, chief digital officers, business and IT leaders, architects and technologists from companies around the world will be there. In between the many informative presentations and during the social events that start and end each day, you can exchange experiences, challenges and successes using Aerospike’s database technology. Breaking news from Aerospike: business use cases, technical deployment strategies, Aerospike roadmap updates, on-site training, interaction with Aerospike executives and technical experts – everything is designed to help your business cost-effectively accelerate digital transformation, with strong ROI. Market demands: Business and consumer activity is increasingly occurring on the edge – at any time, from anywhere. Enterprises need to combine real-time decisioning and operational excellence. Summit ’19 will cover all the bases so that attendees understand how to use Aerospike’s unrivaled blend of availability, speed, scalability and low latency to drive future market success. Great location: The Park Central is conveniently located in the cultural heart of downtown San Francisco; easy walking distance to Union Square, Oracle Ballpark, the Financial District, the Embarcadero and much more. Remember, Summit ‘19 is less than two weeks away – click here to register for one of the few remaining seats.